"I consider myself a road man for the lords of karma. '- Hunter S Thompson. Hunter S Thompson shirt that's full of awesome color and grungy style. Distressed lettering gives it a really frantic appeal. The Hunter S Thompson shirt is one of the must-own items for true fans. Our Hunter S Thompson shirt is available in light or dark colors so you have lots of different choices. We have our Hunter S Thompson shirt available in men's, women's and kids sizes. 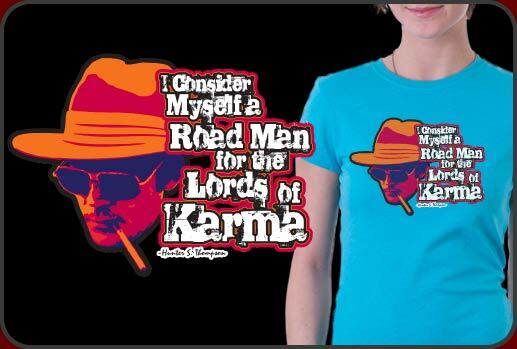 Hunter S. Thompson Shirt: "I consider myself a road man for the Lords of Karma" Truely a priceless quote from the father of Gonzo journalism, Hunter Thompson. This is a beautiful Hunter Thompson Shirt great for any fan of his work.